Honestly, I wonder that Psycho Fox does not show up on this page's top 10. Imagine it was 20 years ago and you wanted to impress a cute girl that is very into video games. Psycho Fox would be a good choice to do so. Funny characters and interesting levels made me sometimes dream of this game after playing it for sometimes more than four hours a day. It is like most jump 'n run games of the Sega Master System. You have to run and jump through 7 different stages, each divided into three parts. Each stage is very unique. Amonst others you have to roam through a desert stage, a wind stage and an ice stage. 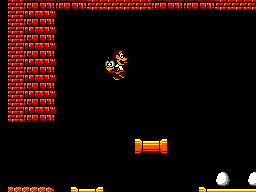 The Ice Stage is the best one I have ever played on a 8 bit videogame console. Moreover, Psycho Fox (the character you play at the beginning) can transform with the help of an herb into a hippo, an ape or a tiger. Each animal has its own characteristics. For instance, the ape can jump way higher than the fox does. To cheer up, the entire thing your opponents look like very weird but also funny, and your boss opponents squint in all sorts of ways when being hit. Always keeping in mind that the game is almost 20 years old, the graphics are just awesome. Once you have got used to the graphics of games such as After Burner or Alex Kidd, you will be just amazed about the graphics an 8-bit console can provide in games such as Psycho Fox. The stages are well designed and so are the characters. 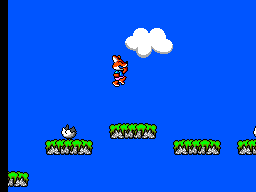 The only weird thing about the graphics is that Psycho Fox for some reason gets a new arm when hitting an enemy. But when you see the Giant Fly rolling its pupils when being sprayed at, you forget about those minor mistakes. The music is fine, but not the best aspect of the game. Stage 1 and 4 have the same tune and so do stage 2,5,6 and 7. I would grade it slightly above average. The same with the sounds that you can hear throughout the game. Psycho Fox is a little stiff concerning the handling. There are a lot of games that a worse in this regard, but also quite a few that are better. 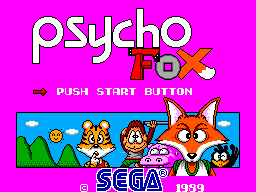 To sum up slightly below average - Psycho Fox is no Sonic. Replay Value? I played the entire game maybe 50 times. Is there anything to add? The game is simply fun. I hope I did not reveal too much, so you guys go out and get the game, because it is really worth playing it (unless you like it serious).